Realm of Horror - News and Blog: Mayhem Film Festival 2017 Report - Day 4. And so the fourth and final day of the Mayhem festival was upon us. 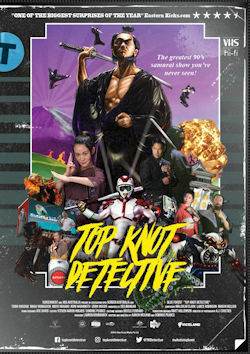 First offering of the day was Aaron McCann's TOP KNOTT DETECTIVE a 'documentary' about a surreal, cult Japanese martial arts series, which aired once on Australian Television back in the early 90s, which was never to be seen again following a scandal with it's lead actor. You may not have heard of this show, but Aussie movie host Des Mangan presents an extremely compelling documentary about its lead actors rise to fame, the shows phenomenal success and the various scandals that caused the shows cancellation and its lead actor's ignominious fall from grace. Mixing interviews with 'archive' footage from the show, which had to be taken from VHS rips recorded from the TV *cough*, McCann's 'documentary' proved a hit with the festial goers and comes highly recomended (if you've no idea what any of this is about, think "This is Spinal Tap"). 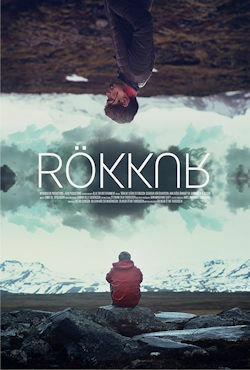 Next up was Icelandic horror THE RIFT (AKA Rokkur) from director Erlingur Thoroddsen, which sadly proved to be my least favourite film of the festival. After receiving a distraught message from his ex-boyfriend Einar (Sigurður Þór Óskarsson). Gunnar (Björn Stefánsson) goes to visit the remote cabin he's at, to make sure he's all right. Only to find all manner of ghostly things going on. Strange noises can be heard at night, strange appearances from shadowy figures. Einar dissapearing, having seemingly wandered off, then just reappearing again. Some of which may be connected to a creepy farmer nearby, plus there's some sub-plot about creepy hitchhikers, which was never explained. Very much a slow burner, I didn't really enjoy this film at all and found myself falling asleep part way through, which may explain why I didn't fully understand the ending. Other people at the festival have spoken more favourably about it, but it just didn't do anything for me, which seemed more like a drama than a horror. Following the annual FLINTERROGATION quiz, hosted by reprobate publisher and long time festival alumni David Flint in the cafe-bar, it was back to the cinema for something very different. The story was highly reiniscent of "The Land that Time Forgot", "At the Earths Core" and various other old films about undiscovered lands, but with a Dr Who inspired sci-fi twist. 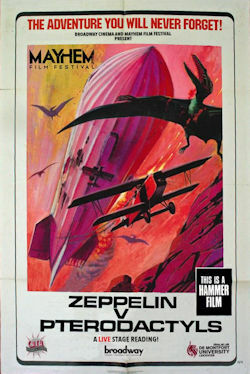 Narrated by Jonny Phillips (Titanic) with a full cast providing the various voices, it was rather like watching an Audio book or Radio Play being recorded and was Mayhem's second attempt at bringing an unmade Hammer film to life (the other being 2015s Unquenchable Thirst of Dracula) and proved to be hit with the audience. Needed more Pterodactyls though. For the penultimate film of the day, we were treated to Director Joe Lynch's (Wrong Turn 2) aptly named MAYHEM. 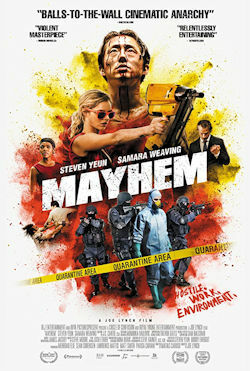 A disgruntled employee at a legal firm (played by The Walking Dead's Steven Yeun) seizes his chance to get back at the crooked bosses on the top floor, when a virus outbreak turns all the employees into homicidal manaics and the authorities quarantine the building. Tremendously funny and outrageously gory, "struggling to make it to the top" and "corporate backstabbing" take on a very literal meaning here in this wonderfully violent cross between "28 Days Later" and "The Office". 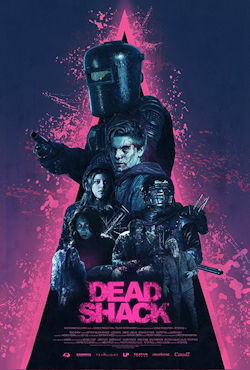 This brought us to our last film of the day DEAD SHACK from director Peter Ricq (Writer - Freaktown), which brought the festival to a close. A group of kids staying at a remote cabin with their friends father are horrified to learn that the woman living in the next cabin over (Lauren Holly - TV's NCIS) has a family of zombies in her cellar and has been feeding local drunks to them. After she discovers them snooping on her, they are subsequently forced to tool up and defend themselves and their passed-out-drunk father from her and her undead hordes in this wickedly funny zombie tale, which had the audience laughing throughout. Visit the film's Facebook page. And thus concluded the Mayhem Festival for another year. A huge thanks to Chris Cooke and Steve Sheil for organising it, along with Melissa Gueneau for arranging my Festival Pass and the entire staff at the Broadway Cinema in Notts for hosting this. Shout outs also to REPROBATE magazine publisher David Flint and the guys from Severin films who were there. Read my reviews of Day 1, Day 2, Day 3 and the Scary Shorts section.